HARTFORD – State Representative Gail Lavielle (R-143) has been named an Environmental Champion by the Connecticut League of Conservation Voters (CTLCV) for the sixth consecutive year. Of the 16 legislators to receive the recognition this year, she was commended for her leadership on issues related to electric vehicles and bottle recycling during the 2017 legislative session. The Connecticut League of Conservation Voters is a bipartisan, statewide, nonprofit organization dedicated to protecting Connecticut’s environment by making it a priority for elected officials. CTLCV works with the state’s environmental advocacy groups to identify, highlight, and track important bills that affect Connecticut’s natural resources, including air, water, wildlife, open space, and health. Following each legislative session, it recognizes a number of lawmakers for their leadership on environmental issues by naming them Environmental Champions. During the 2017 legislative session, Rep. Lavielle supported legislation aimed at securing dealer licenses for electric vehicle manufacturers in Connecticut. 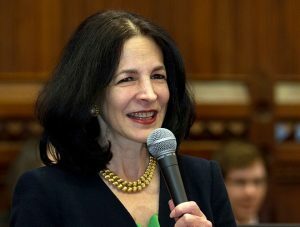 She also helped defeat an effort to dismantle the state’s landmark recycling law, succeeding in retaining Connecticut’s bottle deposit refund program. In addition to her efforts in these areas, Rep. Lavielle was a vocal supporter and co-sponsor of a constitutional amendment resolution protecting state conservation lands. She also supported legislation designed to improve the DOT’s management of tree removal on state highways, as well as successful efforts to ban the disposal of fracking waste in Connecticut and to improve access to water planning data. The post Rep. Lavielle Named Environmental Champion for Sixth Straight Year appeared first on State Representative Gail Lavielle.